Join me on my adventure to hack my home. 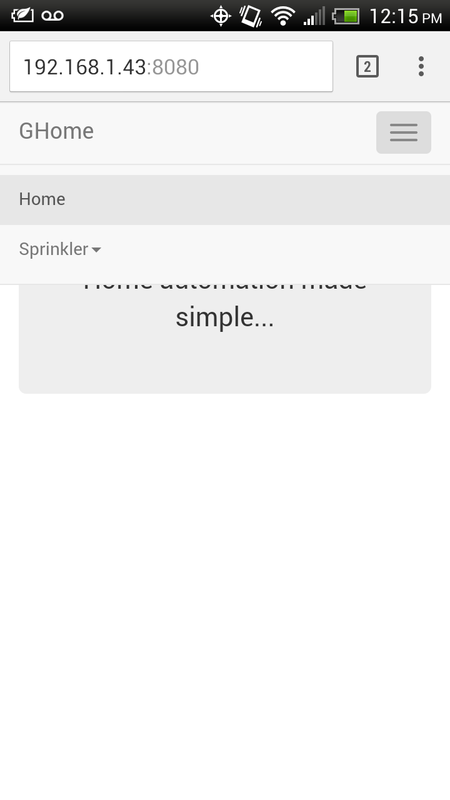 I am not a fan of the commercial, closed source, proprietary home automation systems on the market, so I am building/designing my own from scratch, starting with a smart sprinkler system. 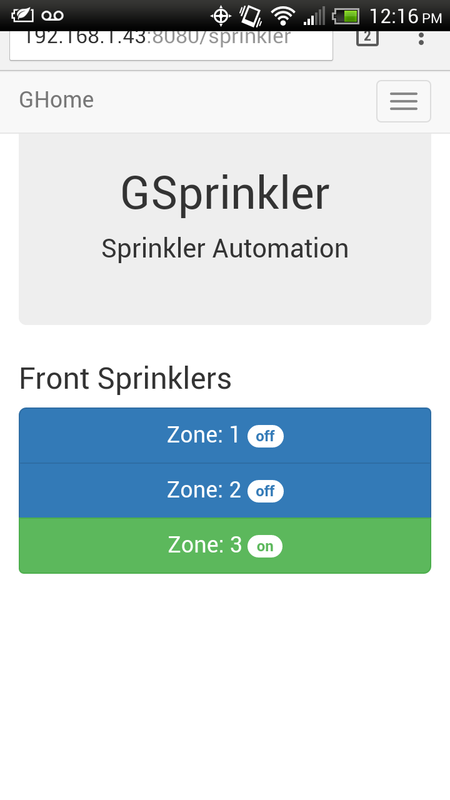 Automating my sprinkler system is the first project for my home automation system. This is currently a work in progress. Powers the Arduino and shields. This was repurposed from an old bluetooth wireless mouse/keyboard. The Sketches below are iterative progressions as I work through the build. Day #1 [gsprinkler.ino] - Initial POC. Alternates turning zone 1 and 2 off and on for 30 seconds. Day #2 [gsprinkler2.ino] - Added support for a simple web server. This version was based on the Arduino WebServer example (Examples > Ethernet > WebServer). My version includes a JSON response and minimal support for toggling zones on and off. Sending a request to http://192.168.1.40 returns the status of each zone, and passing toggle=<zoneNumber> as a request parameter toggles the state of the relay for the given zone. For example, http://192.168.1.50/?toggle=1 turns on the sprinkler for zone 1 (assuming it was previously off). Configure a secondary router to run in client bridge mode. This basically turns an old router into a wireless client. 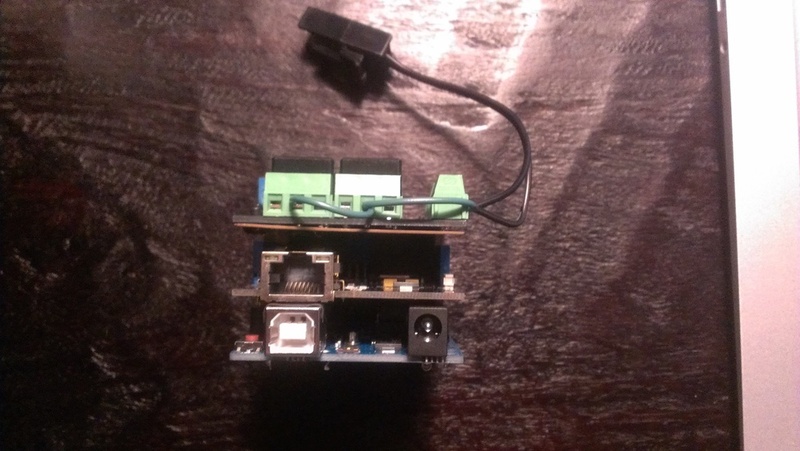 You can then plug in your Arduino's ethernet port to the router. I am not a big fan off running long ethernet cables from my office to the garage. I had an old Linksys WRT54G router that I flashed with DD-WRT and then followed these instructions. Download and install the Seeed Ethernet library. Upload the latest sketch from my GitHub project. Cover the USB connector with electrical tape to prevent the shield from making contact with the Arduino. 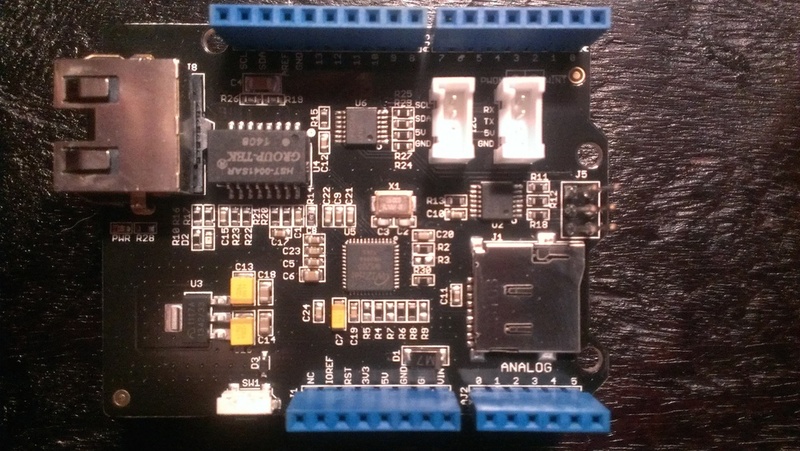 Place the Seeed Ethernet Shield on the Arduino. Place the Seeed Relay Shield on the Seeed Ethernet Shield. Wire the positive 24V wire to the common (COM) pins and wire each sprinkler zone to a normally open (NO) relay. I only have two zones, so I only wired the J1 (COM1/NO1) and J2 (COM2/NO2) interfaces. Wire the neutral 24V wire and ground from the sprinkler to an unused relay (NOX). I used the J4 interface (NO4). Connect an ethernet cable to the Seeed Ethernet Shield and to port 1 on the router. Actually, in port will work with the exception of the WAN port. Connect the 9V DC adapter to the Arduino. This will provide enough power to power to all three (3) boards. The Arduino power adapter page indicates that you need at least 250mA current output, however, mine is only 200mA and it appears to work fine. Connect the 9V DC adapter and 24V transformer to an outlet. Once everything is powered on, hit the reset button on the Arduino otherwise the ethernet will never initialize this. This is a known problem. Test and mount everything in the enclosure. Cover USB connector with electrical tape. Attach Seeed Ethernet and Relay Shields. I already had this device. It has a small form factor and is fairly quite. Since it is a netbook, I get a system with a battery backup system for "free." The server needed for this setup requires very little horse power. I decided to go with the minimal install of CentOS 6.6. I chose CentOS since I am a long-time Red Hat user (since the 5.2 days) and typically work with RHEL and CentOS servers in my day job. The minimal install is perfect as I don't need X Window and really need a server install. The Asus Eee PC boots nicely off a USB thumbdrive. I created the bootable USB using my Mac by following these instructions. Although these instructions are from the Ubuntu site, they work with any .iso image. I prefer to manage this server remotely via SSH as the keyboard is incredibly tiny. By default, the SSH daemon is enabled and the relevant iptables rules allow remote access to port 22.
to '/etc/ssh/sshd_config' and restarted SSH. Not yet implemented. However, Varnish will function mostly as an HTTP proxy to Node.js. Node.js provides a simple web server and hosts the REST-based APIs. The client application is a Single Page Application built on AngularJS and Bootstrap. Not yet implemented; however, the Sinlge Page Application works perfectly on mobile. [x] Replace 9VDC 200ma adapter with 9VDC 1000ma adapter. The former was not providing sufficient power to all three boards. Add support for security. Currently, anyone on the LAN can control the sprinkler system.